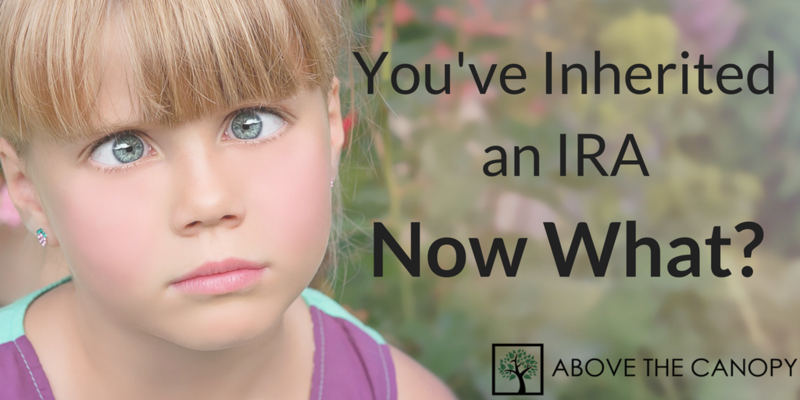 Inheriting an IRA is quite a bit different than inheriting any other asset. Unlike cash or investments in a traditional investment account, if you inherit an IRA you’ll need to start withdrawing from the account in order to avoid hefty penalties. In this post we’ll cover what your options are when you inherit an IRA, and how you can best manage it for you & your family. Whereas many of your assets will be distributed to heirs according to your will, IRAs are instead distributed by contract. Your custodian (the brokerage firm that holds your account, like Vanguard or TD Ameritrade) lets you designate as many beneficiaries and contingent beneficiaries as you like. Once you die, your account bypasses your will, the probate process, and is distributed according to this beneficiary designation. When account holders don’t designate any beneficiaries things get a little murkier. When the account holder dies, their account is distributed according to their custodian’s default policy. At most custodians this default policy diverts the IRA back to their estate (and goes through probate) but at some it’s diverted to their spouse first. Unfortunately, if the account holder didn’t designate a beneficiary while they were alive, you’re at the mercy of your custodian’s policy. If the account is indeed diverted back to their estate, it’ll be distributed according to your state’s interpretation of their will. And if they didn’t have one (meaning they died intestate), the state will make its own decision on who should inherit the asset. The moral of the story? Take advantage of the opportunity to bypass probate, and designate your beneficiaries formally while you’re still alive. Managing your financial affairs is a big job. You have to keep track of your income, manage your assets for long term growth, pay taxes, and arrange for your estate to be distributed after you die. You can do some of these things on your own. But others, like writing a will, are jobs you’ll probably want to hire a professional for. Since we’re in the middle of tax season, I thought it might be helpful to cover exactly what to look for when hiring an accountant. Paying taxes is a fact of life. But if you can find creative ways to reduce the amount of tax you pay, there will be more left over for you and your family. It’s for this reason that an accountant is often one of the professionals families hire for money advice. You can certainly prepare your own taxes if you prefer. Programs like TurboTax and TaxAct provide quick and affordable ways to compile your financial records and file your taxes. There is no program that can help you with tax planning, though. TurboTax and TaxAct are great for tax compliance, where you’re reporting on transactions that’ve already happened. But if you’d like to know how you might reduce your tax burden in the future, you’ll need some help making decisions on transactions that haven’t happened yet. This is tax planning, and something that many accountants are very good at. 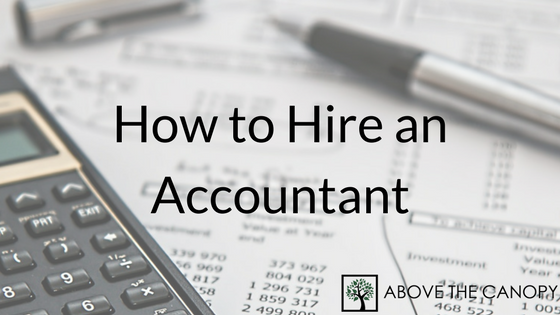 I covered in a recent post how you can tell whether you need to hire a CPA. Today’s post will cover how to go about hiring one if you do. In general I’m a pretty big nerd when it comes to all things financial. I love a good spreadsheet, and really enjoy analyzing a solid set of statistics. These are some pretty astounding numbers. You may have already heard that tuition costs are going up 7% each year, or that as a country we now have more student loan debt than we do credit card debt. But a 510% increase over ten years is astronomical. Since saving for & affording college is relevant to the majority of parents, I thought it’d make a great post on the blog. So, today’s post covers affording college & need based financial aid. To get to the bottom of the issue, I’d like to welcome Melissa Ellis to the blog. Melissa is the founder of Sapphire Wealth Planning, a CERTIFIED FINANCIAL PLANNER™, and a subject matter expert when it comes to education planning. Insurance agents love to pitch whole life insurance. This is sometimes a controversial topic, but the truth is that insurance agents make massive commissions on permanent life insurance when compared to term policies. Because of this, it’s not uncommon to see agents find creative ways to work permanent life insurance into a financial plan. The truth is that most people simply don’t need permanent insurance, and are far better served with a term policy. Whole life insurance is costly, and offers very poor return potential. 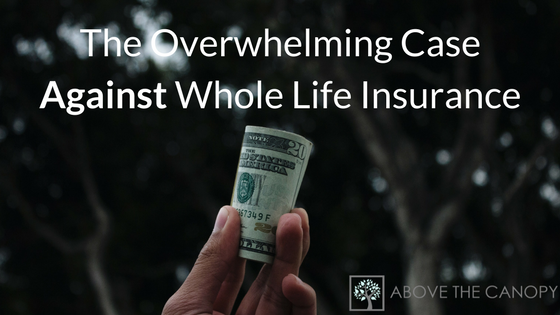 This post will cover what whole life insurance is, and why most people are better off with lower cost alternatives. In order to understand whole life insurance, we really need to understand term life insurance first. With term life insurance policies, you’re paying an insurance company a monthly premium in exchange for old fashioned, plain vanilla insurance on your life. If you die while the policy is in force, the insurance company will pay your beneficiaries a death benefit. Since it’s a term policy, it’s only good for a certain amount of time. Most term policies are written for 10, 20, or 30 years, and have level premiums throughout the life of the policy. By and large, term policies are the best way to insure your life. They’re inexpensive and straightforward. Plus, the whole reason most people insure their lives is to protect against the chance that they die before becoming financially independent. Once they become financially independent there’s rarely a need for life insurance. You have enough assets to pay for your lifestyle, which can be distributed to your heirs after you go. 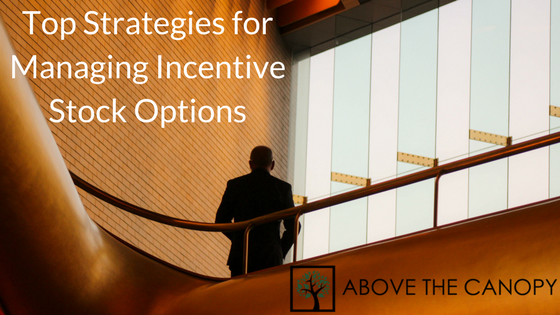 Incentive stock options, or ISOs, are a pretty common way for companies to compensate management and key employees. Otherwise known as “statutory” or “qualified” options, ISOs are a way to give management a stake in the company’s performance without doling out a bunch of cash. While they can have wonderful tax benefits, far too many people who own ISOs fail to exercise them wisely. Some estimates even claim that up to 10% of in the money ISOs expire worthless every single year. If you own incentive stock options but aren’t sure how to manage them, read on. This post will cover a few of the top management strategies at your disposal. Sponsoring a qualified retirement plan is a pretty convenient way to defer taxes AND offer your employees a valuable benefit. It comes with some hefty responsibilities, too. Among other things, you’re obligated to act in the best interests of your participants, monitor expenses & performance, and make sure everyone’s getting the proper disclosures. 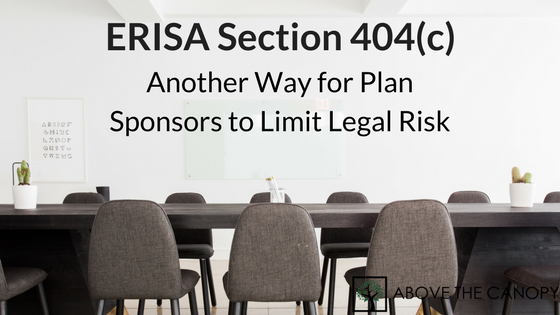 However, to make your life easier ERISA includes six nifty safe harbor provisions. By following a few additional guidelines your plan can qualify for these safe harbors, which relieves you of certain fiduciary responsibilities. We covered one of the six safe harbors a few weeks back: auto-rollovers. Today we’ll cover another safe harbor: section 404(c). This section has to do with who is responsible for the investment performance in your participants’ accounts. If you’re responsible for a qualified plan and are curious about how you can limit risk, read on. You’re in the right place. You’ve heard it before: life changes once you have kids. As the proud parent to a six month old baby boy, I can attest that the rumors are true. Having kids brings a quite a bit of chaos to your life. And to try to get a handle on things we’ve read several of the popular contemporary baby books. In most of them the message is the same: apply a consistent routine. When your baby knows when to expect sleep time, feeding time, or play time, they gain confidence and often start to excel. In other words, routine = fewer moving parts, less chaos, and more confidence. I think our personal finances have a lot do with this as well. When you have a kid your financial picture changes. You have different and greater obligations, and need to start thinking about college costs. The fewer “loose ends” you have with family finances, the less chaotic your family life will be and more you’ll thrive. So to help us get a feel for the financial side of parenting, I’d like to welcome my guest Josh Brein to the blog. 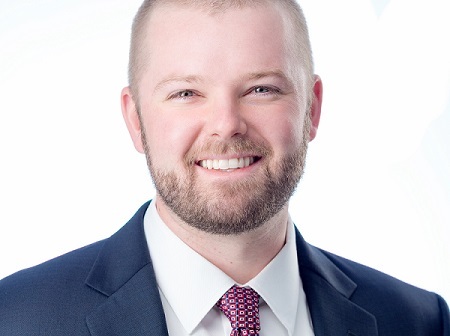 Josh is a Seattle financial advisor and president of Brein Wealth Management, LLC. He’s also a proud dad to his daughter Erin. Today, Josh will share with us how your finances change once you become a parent, as well as essential financial moves new parents should make. Today’s post is another on the topic of financial independence. We’ve had several of these recently, but since that’s the focus of this blog I guess that’s not surprising. Rather than discuss the fundamental components of financial planning like insurance or investing, today’s focus is entrepreneurship. Specifically, how entrepreneurship can be a wonderful way to align your career with your lifestyle and become financially independent on your own terms. Forewarning: today’s post is another that falls on the philosophical side of the spectrum. I normally don’t write too many of these posts, and realize there’s already been several to start the year. Read on if you’re OK indulging my abstract (and possibly poor quality) musings. 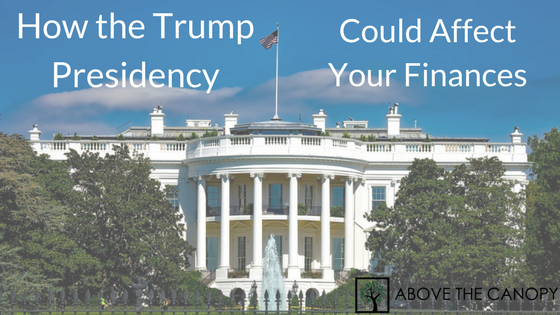 Recently I’ve had a few questions from clients and readers about what they should be looking out for now that we have a new president in office. As you know, Mr. Trump has had a pretty eventful first few weeks in office. In fact, as I write this protests are underway at no less than 15 major airports across the country. In this post I’m going to share some of the trends and data points that I’m keeping an eye on, and on some discuss how they might affect your financial situation. This post is in no way political. This isn’t an endorsement or criticism of president Trump or his policies. My objective here is simply to share some thoughts about how our new president might impact our finances and what you might want to look out for. As one of my clients phrased it recently, we’re all in this boat together. Like or not we just have a new captain at the helm. There are many unfortunate things that can happen to us that risk our pursuit of financial independence. Some of them we can manage & control, others we can’t. For the “stuff” out there we can’t control, insurance allows us to transfer risk to an insurance company in exchange for a nominal premium. 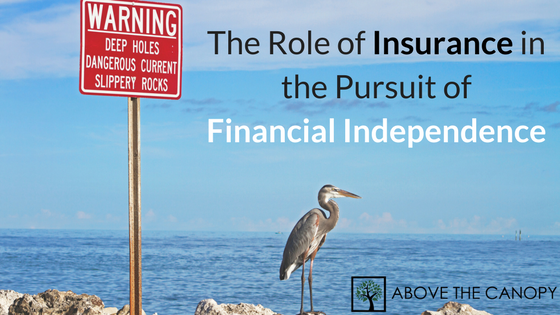 This post covers the role of insurance along your pursuit toward financial independence. It’ll also cover a prudent risk management framework. If used correctly, financial independence no longer becomes an aspiration that may happen – it becomes an inevitability. 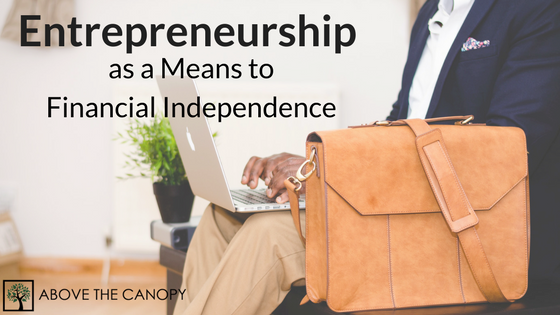 Financial independence is a goal many of us share here in the America. It’s also, of course, the focus of this blog. For the baby boomer generation, financial independence lines up very closely to the traditional American career path: enter the workforce in your 20s, put in 40-45 years, and fully retire sometime around age 65. Younger generations are starting to explore more creative paths to financial independence, like extreme budgeting and newfangled forms of entrepreneurship. These are risks that we face every single day. They jeopardize our assets, our ability to earn income or both.